At last: the Apple iPhone 5? The Apple iPhone 5 has been rumoured for a long time, and it was widely expected to be launched last year, but the rumours are that the development was canned by Steve Jobs and instead we got the iPhone 4S. 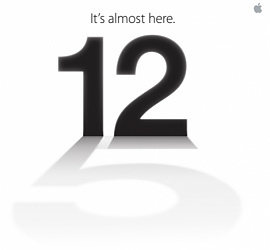 Well, Steve Jobs died before his time.. but it seems that the iPhone 5 isn't dead and according to several sources, it looks like Apple may well be announcing the next-generation iPhone next week on September 12th with an invition to several news organisations (pictured) which is compromised of a number "12" with a shadow reading "5". While there are lots of rumours about what might be in the iPhone 5, it does seem most likely that it will have a bigger display. When the original iPhone launched five years ago, the 3.5" display looked pretty big compared to what else was out there. But in 2012 most rival high-end smartphones have a 4.3" display or larger while the iPhone range stuck at the same comparatively small size. Purported leaked devices show an iPhone 5 that is much taller, possibly offering a 4" display that will allow widescreen video playback and enhanced web browsing when the phone is rotated. Other rumours include NFC support, nano SIM cards and of course you can expect it to be faster and cleverer than before. Whatever is in it, you can expected it to be available by the end of the month. Unless of course Apple is going to throw another surprise and launch a 5" version of the iPad instead..